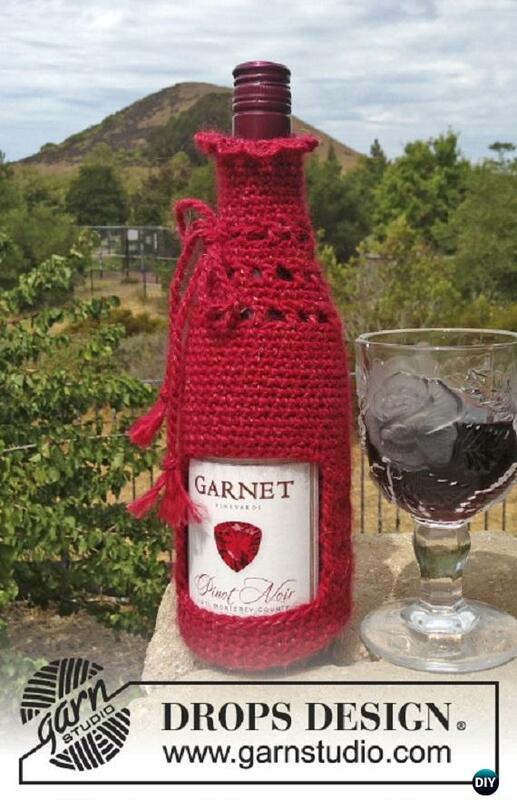 A holly jolly drunken collection of Crochet Wine Bottle Cozy Bag & Sack Free Patterns. Our Crochet Channel today is going to crochet these wonderful handmade gifts for any hosts you will go to this holiday. These Bottle Cozies are really quick and easy to crochet and you only need oddments of yarn to make them. While it was designed for wine bottles, the pattern includes instructions for adjusting the size, so it could be used for any other similarly shaped bottles! Scroll down and see which ones will be your next project to dd a personalized handmade touch to store bought items! Slip a nice bottle of wine into these lovely cozy, and you’re ready to go! Super quick and easy to work up and fun to enjoy. The free pattern is an Amigu pattern, yet you can crochet the hat to cover the bottle to the bottom, crochet the bottom and add button for opening.